Here is my unusual Crown Lynn fruit bowl !! It is stamped with the crown & one star, but also with Catherine Anselmi stamp (I'm sure that's what it is). The glaze is unusual, and I was expecting the fruit to be over an original glaze, but no, one glaze and the white is very white. 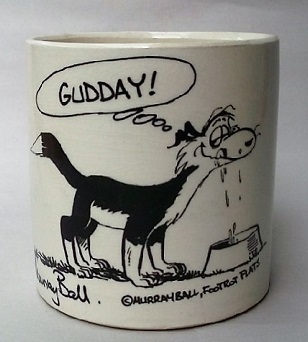 I don't know what the black lettering means, but is under or within the glaze (the 92 is the same number as in the link below, but 1992 seems too late). 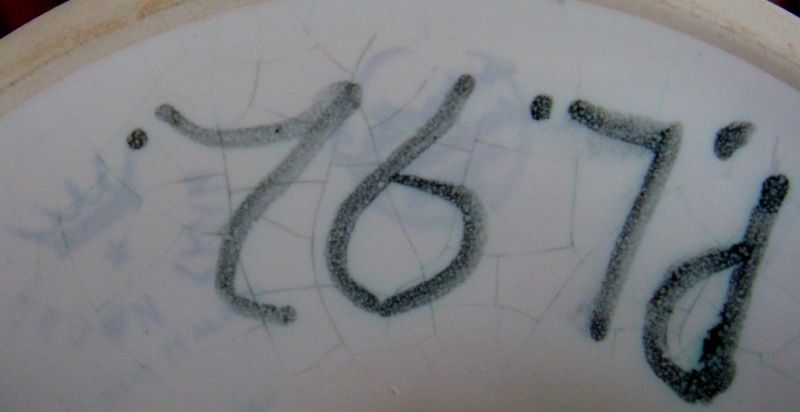 The only other marking is on the unglazed interior of the pedestal, and I'm sure it is the number 8. The other photos may help you to see my new treasure better. I don't know the connection between these two, except for the article I read on here (this site) about her buying some Crown Lynn equipment. Perhaps she purchased some blanks? Although, where did the CL stamp come from? I found this plate also, the stamp looks the same and it also has the '92. 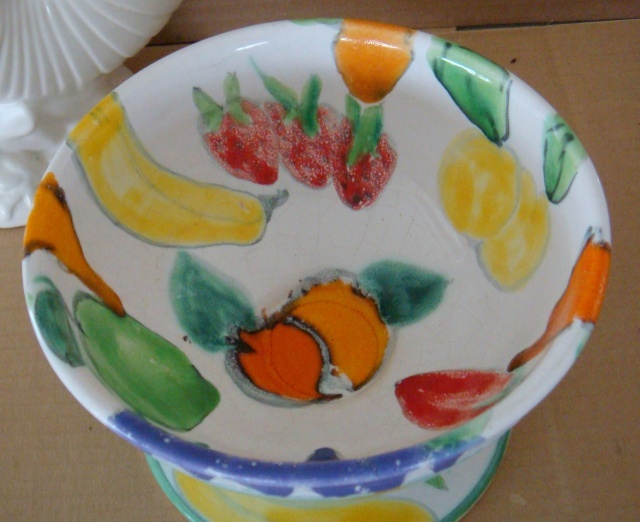 Re: Crown Lynn & Catherine Anselmi stamped fruit bowl !! 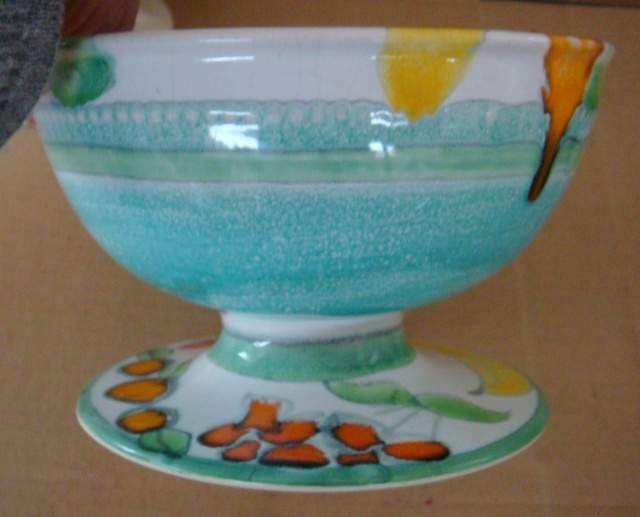 I would suggest that P L is the intitials of the artist who decorated the bowl and will look out the New Zealand Potter mag I have with an article on Catherine, as I'm sure it has names of decorators that worked for her. That link to ebay was great, as it gave the name of Angela Thomas as the artist. I've seen both stamps on wares the same shapes as Crown Lynn ware before. No idea how she got an old Crown Lynn stamp, but if she got hold of their moulds, perhaps there were stamps available as well ....? One of Crown Lynn's top slip casters worked for Catherine - will find his name when I locate the article. Thanks for taking the time to find all that out Ev, you are a treasure! I read somewhere online also, that Catherine employed at lease one ex Crown Lynn staff member. Another thing I noticed while researching her (or trying to), was that every piece I found on auction or on show had crazing like mine ~ fascinating ! The Crown Lynn stamp indicates that it was a Crown Lynn mould (shape) acquired and produced in the Catherine Anselmi studio. 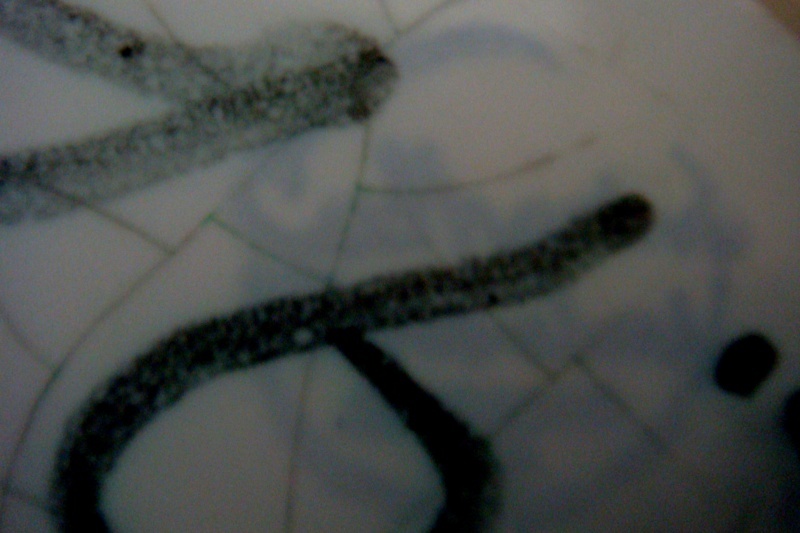 The Catherine Anselmi stamp indicates it was produced in the Catherine Anselmi studio. The letters or name indicate the person who painted it and usually the year was added. If there is no name and date this usually means it was a production design that anyone in the studio could have painted. We had permission from Ceramco to use the Crown Lynn stamp on shapes that originated in Crown Lynn. So your piece is painted by Pamela Lim 1992. 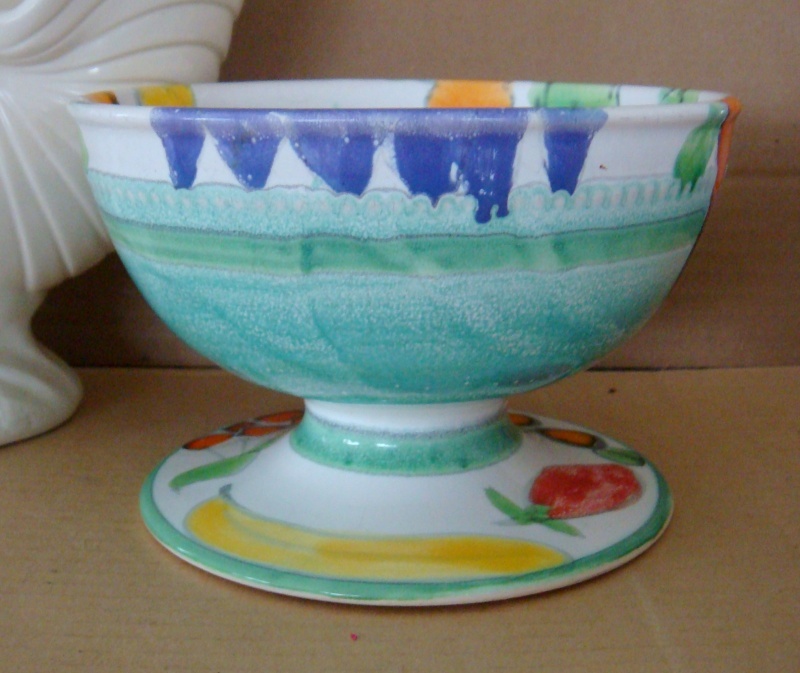 It was a tin majolica glaze with colours applied on top of the glaze - very different from most of our other work. Yay Welcome Catherine it will be great to have your help! Thank you so much for that information Catherine, it makes my bowl even more special to me now! Catherine, can I ask you to confirm that the bowl would be a Crown Lynn shape, because it has the stamp, as I would like to work out which shape it would be?